Pastors and students will appreciate this new edition with its up-to-date bibliography and discussion of pertinent issues. 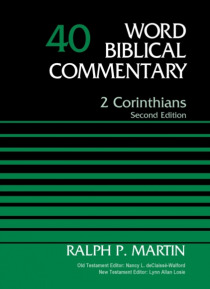 In this full revision and update of the book of Second Corinthians, Dr. Ralph P. Martin addresses the scholarly questions about the text of the epistle and the significance of Paul's thought for Christian living and ministry.In a penetrating analysis of Paul's responses to the… various crises within the Corinthian congregation, Dr. Martin gives insight into the particular problems of Christianity as expressed in the hedonistic, cosmopolitan setting of Corinth. He shows how Paul's attempt to clearly distinguish the gospel from Hellenistic Judaism and Hellenistic Jewish Christian ideology results in a moving statement of the Christian message. Rather than the ';theology of glory' prevalent in Corinth, Paul articulates his theology of the Cross as a ';theology of weakness,' of servanthood and ministry. What was at stake at Corinth, says Dr. Martin, was ';nothing less than the essence of the kerygma as in expressed in the way of the cross. . . for proclamation and daily living.' New sections on the Collection and Rhetoric have been added, and the issues of Composition and Social Setting of the letter have been included, along with topics such as the Spirit, the Opponents, Paul's Theology, and the Resurrection in this epistle. The Word Biblical Commentary series offers the best in critical scholarship firmly committed to the authority of Scripture as divine revelation. It is perfect for scholars, students of the Bible, ministers, and anyone who wants a theological understanding of Scripture.